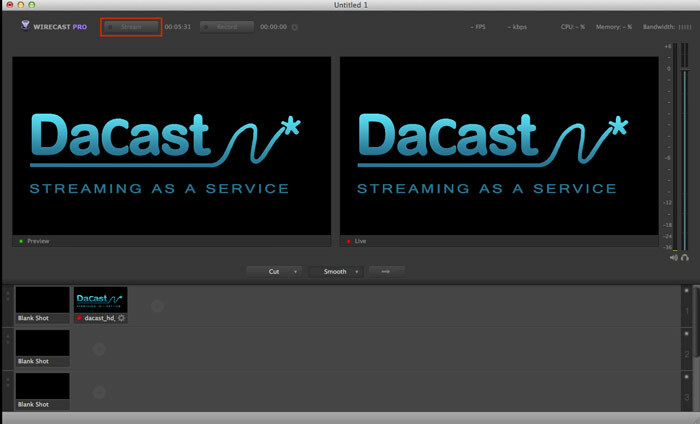 Please note: the most complex part of Wirecast multi-bitrate live streaming is to first set up your encoder. 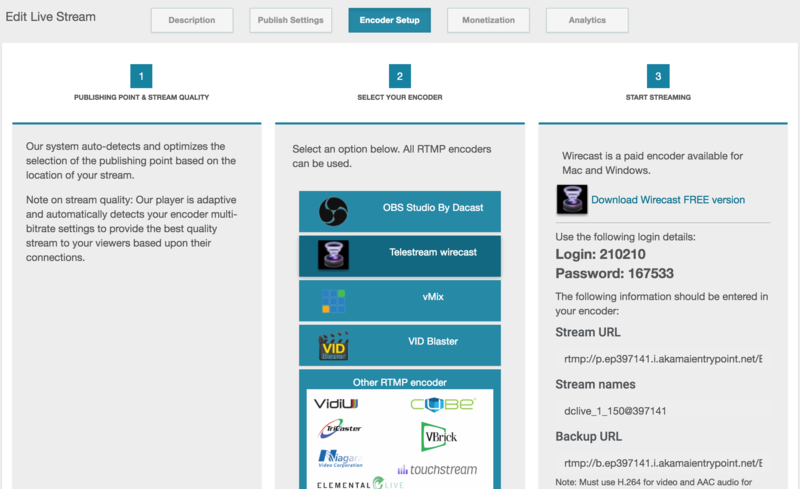 You will use DaCast to retrieve some information, and then our adaptative player will automatically detects your encoder multi-bitrate settings. This tool allows you to provide the best quality stream to your viewers based upon their individual connections. Enter the stream URL and the stream name as shown below. 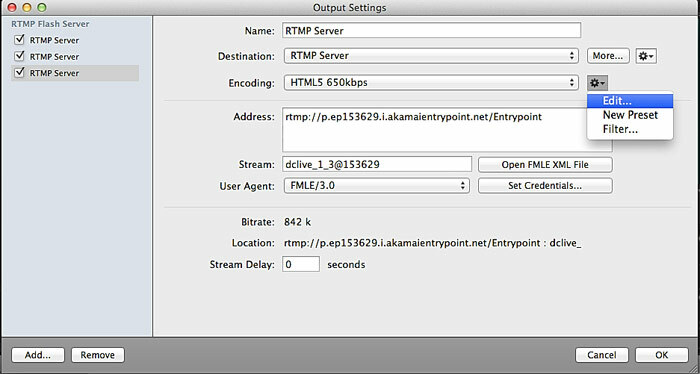 Make sure, that the stream is correctly set up for HTML5. To do so click on the clockwork icon near the ENCODING dropdown and choose EDIT or NEW PRESET. The default settings in Wirecast 7 are HD settings so make sure to customize your settings in order to offer a low, standard and high definition without running out of bandwidth too quickly. Also keep in mind that your total bandwidth requirements will be the total of all your streams added together, audio and video bitrates. If you plan on recording your stream using our Auto Archiving feature remember that the maximum bitrate is 3.5Mbps in total. You will be asked again to “Select an Output Destination”. 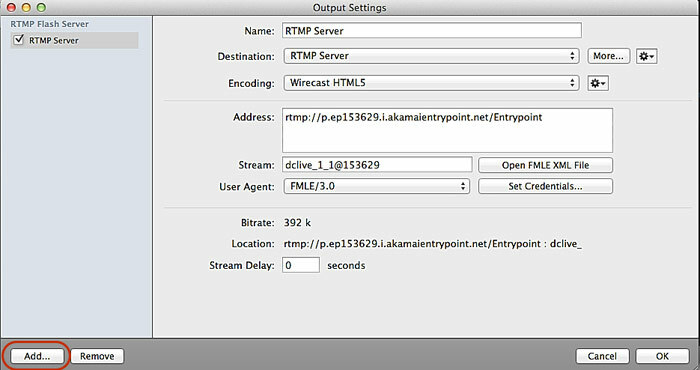 The destination should be “RTMP Sever”. Click on OK. The same information as the first stream you created should be entered. You can change the bitrate under ENCODING, by selecting another preset in the dropdown (don’t forget to check that the new preset is set for Wirecast as mentioned above). Enter again the Credentials for each stream. Once you have entered all streams, click on OK. You are now ready to stream: click on STREAM. Your viewer should be able to switch from one bit rate to another, by clicking on the HD icon located on the bottom right corner of the player.